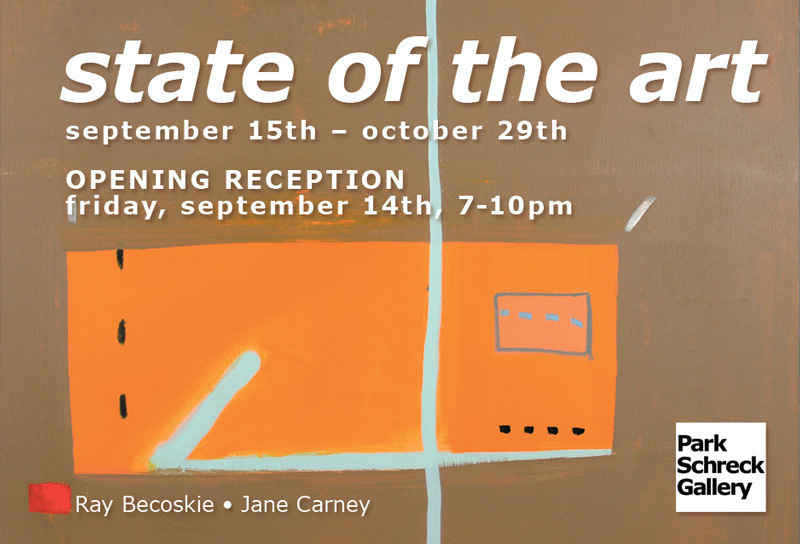 Park Schreck Gallery is pleased to announce the upcoming show State of the Art, featuring work by Ray Becoskie and Jane Carney. We are thrilled to feature Ray Becoskie in another show. His recent solo show at the gallery was a huge success. Ray’s sophisticated yet playful compositions would make a welcome addition to any home. The gallery would like to give a warm welcome to Jane Carney. Jane is a brilliant abstract artist out of Evanston, Illinois. Professionally she teaches art at Loyola Academy. Her work has a simple palette that evokes great depth. She is another one of our artist/teachers that inspires youth to pursue the arts! This entry was posted in Openings and Events and tagged art, Chicago, Jane Carney, Park Schreck Gallery, Ray Becoskie. Bookmark the permalink.